I have developed a map of the Lower Prospect Avenue Prowl that is easier to print & carry than printing the CommunityWalk Map. You can download it below. 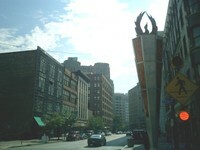 WCPN 90.3's Mark Urycki interivewed me a couple of weeks ago about CityProwl Cleveland. The interview is running on the radio today at 7:35 am & 5:45pm, but you can listen to it online here. I was clued onto this incredible website called CommunityWalk that can create customized maps. I have developed a map for the Lower Prospect tour that includes pictures, links and all kinds of information that I am still discovering. You can toggle between a map view, satellite view or a hybrid of both. Thanks to CityProwler Stuart Spivak for the heads up! Click on the title in the green bar to get to the full map. I'll be uploading pictures & tweaking the map in the next couple of days. On the first episode of CityProwl Cleveland, tour an area that was and continues to be a vibrant business district. I'll tell you all about the architecture, the history of the neighborhood and points of interest you probably never knew existed. The tour starts at the corner of East 4th St. and Prospect Ave., in front of Flannery's Pub and lasts about 37 minutes. Let's meet up and get prowling! When you complete this first CityProwl tour, please tell us how you liked it. CityProwl needs your feedback on how to make future tours easier, more informative and most importantly, fun. You can leave comments at this post or email me at the link to your right.